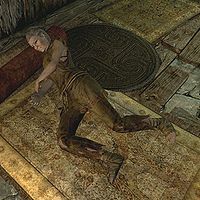 The Addict is an elderly citizen found dead in Redwater Den in one of the booths set up for enjoying Redwater skooma. She wears a roughspun tunic and footwraps. This page was last modified on 27 January 2016, at 00:16.